Think Your Partner is Cheating? There’s an app for that! Think you can tell if your partner is cheating? Now you don’t have to as a new interactive app can do this for you. AreTheyACheat.com employs expert knowledge from IllicitEncounters.com, the UK’s largest married dating website, to establish whether your relationship is at risk of infidelity. The app scores your answers based on a cheating partners actions in situations within a cohabiting relationship – 10 points if they have had a sudden ‘increase in overtime’, 10 points if they’ve recently ‘become obsessed with their appearance’ etc – the higher the score the increased possibility they are having their cake and eating it. With twelve likely scenarios, this method will establish whether someone’s partner is being unfaithful, whether there is a high risk of infidelity or whether someone is being overly paranoid. AreTheyACheat.com fulfils its purpose – the app functions to reveal whether or not a person is being cheated on – the cheat-o-meter is designed to know what to look out for, as well as inadvertently showing what not to do for those who are considering taking on a mistress or histress without getting caught out. 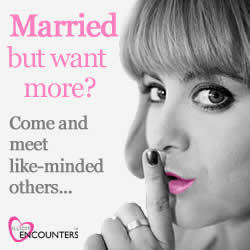 With close to 1 million members using IllicitEncounters.com – accounting for approximately 7% of the UK married population; it is clear people seeking affairs is on the rise. To put it bluntly, technology is making it easier to have an affair and get away with it. Year on year there is an increase in registrations, suggesting people are moving away from the conventions of a traditional offline affair and utilising the technology available to them to keep their adultery under wraps instead. Spokesperson for IllicitEncounters.com Claire Page said “It is becoming pretty evident that the UK is obsessed with affairs! We love to hear about them, talk about them, and now we enjoy taking part in them – it’s a natural progression. Of course the whole point of an affair is for it to remain discrete. AreTheyACheat.com isn’t just for people who want to find out if their partner is cheating, but also for the adulterer who wants to check they are not making any school boy errors.